The crew of F/L D.J. Corcoran had numerous changes from its arrival on July 6th 1943 until the night of August 31/September 1st. WO A.G. MacKenzie, WOII Hans D'Aperng, F/O D.E. Larlee were members of the Corcoran crew for all of his operations, other then his two sorties as 2nd. Pilot. Air Gunner Sgt. J.T Venier was with the crew for the first five operations, Four different gunners took his place for the next four operations. 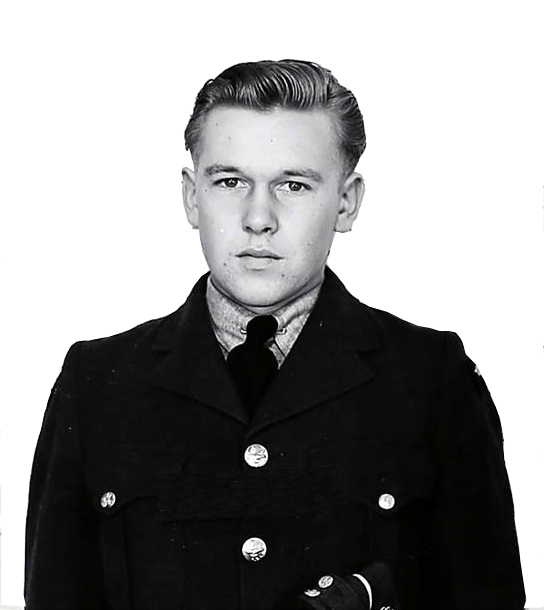 Bomb Aimer P/O L.C. Webley remained with the crew for four operations before F/S Albert Harris took his place. Flight Engineer Sgt. Holdsworth was replaced by a series of Flight Engineers with Sgt. J.C. Allan flying five of the next operations before two other Flight Engineers took his place on the final two operations. Both Sgt. Dennis Sweet and Sgt. W.E. Greensides were on their first operation with Corcoran when this Halifax was lost. On their very first operation JD331 lost the port outer engine, they continued on completing the bomb run then Corcoran brought it back to base successfully on three engines. He was one of two Moose aircraft to have returned on three engines that night. On August 10/11 three operations later JD331 again had engine failure, this time over the target area. It was reported that all instruments failed, including the Gee device. On the return trip he had the Wireless Operator send two SOS messages. The messages sent while near Le Havre were thought not to have been received. The Halifax landed at West Malling without any problem. The crew would be separated from JD331 for the next two sorties, before being reunited with JD331. JD331, VR-K was over Hanover when fighter flares fell on both sides of her. Both gunners reported sighting another Halifax directly beneath their own aircraft. A few minutes later Monica began to indicate an aircraft approaching them from the rear. The gunners could not find the attacker indicated by Monica signal. A fighter then came from below and VR-K was being hit from the nose section along the bottom right to the tail section where a shell crashed through the side of the rear turret. F/O Larlee in the rear turret escaped injury from the shell. Indications are that the fighter pilot screened his aircraft behind the lower Halifax and continued up beneath JD331 then opened fire. Although the source mentions the fuselage was raked from nose to tail, it is unclear if the Monica detection system started signalling because it sensed the Halifax which was below JD331. Or if it was the JU-88 which Monica detected. If it was the night fighter the attack would have then been from tail to nose along JD331s fuselage bottom. If the Ju-88 had attacked from the nose Monica would not have seen it. It could be that the source just listed the attack damage but not in the proper sequential order. Larlee checked out his gun turret and found it still worked. He also noticed that the port wing and engines were now on fire. With the Halifax in flames a second attack came from port quarter below. Larlee fired in the direction that the enemy gun flashes came from, still not able to see the fighter itself. The bomb bay loaded with bombs was on fire, the hydraulics were now unserviceable and the bombs could not be quickly dropped. The bombs could only stand so much heat for a short period of time before exploding. F/L Corcoran called for a bail out using the call light while holding the aircraft as straight as possible using all his strength. From that point on he only remembered undoing his Sutton harness getting ready to bail out. He blacked out at this point and it was as he drifted down that he regained consciousness. Some indications of an explosion are noted in reports. They may have occurred as Corcoran was leaving the aircraft. He found that his parachute ring had not been pulled, so the parachute was opened by some other method or force. He also found the earphone section of his flying helmet were ripped off the helmet. He also had bruses around the head and shoulders which could have been caused by an explosion. When F/O Larlee made his exit from his rear turret the air steam pulled him out while entangling his left foot in part of the turret structure. The rear gunner was now being dragged down by being partly trapped in the falling aircraft. He finally managed to free his foot about 2,000 feet from the ground. His landing had attracted the attention of firearms wielding farmers who could easily see the white parachute. With a badly sprained knee and torn ligaments in his leg he could not out run them. He was captured by the men, and it must have been a terrifying experience, no mention of what transpired after he was caught. Greensides oxygen mask was blown off during the fighter attack. He then lost consciousness. He reported being picked up by the enemy near the aircraft. Perhaps thrown from the aircraft when it crashed. The wording makes in unclear what exactly was meant by his remarks. WO MacKenzie remembers seeing F/S Albert Harris waiting for his turn to jump. It is thought that Harris was also caught in the explosion of the aircraft as the bombs reached the point which caused them to explode. D'Aperng had been with the 419 Squadron earlier and had flown in Wellingtons. On October 10th 1942 he along with others of P/O Lewis Scobie's crashed shortly after takeoff after one of the Wellington's engines failed. Wellington BK335 Two of the crew, including Scobie were killed after the aircraft crashed and burned. D'Apreng was severely injured in the crash and spent months recuperating. He then rejoined his former squadron and flew with F/L Corcoran.